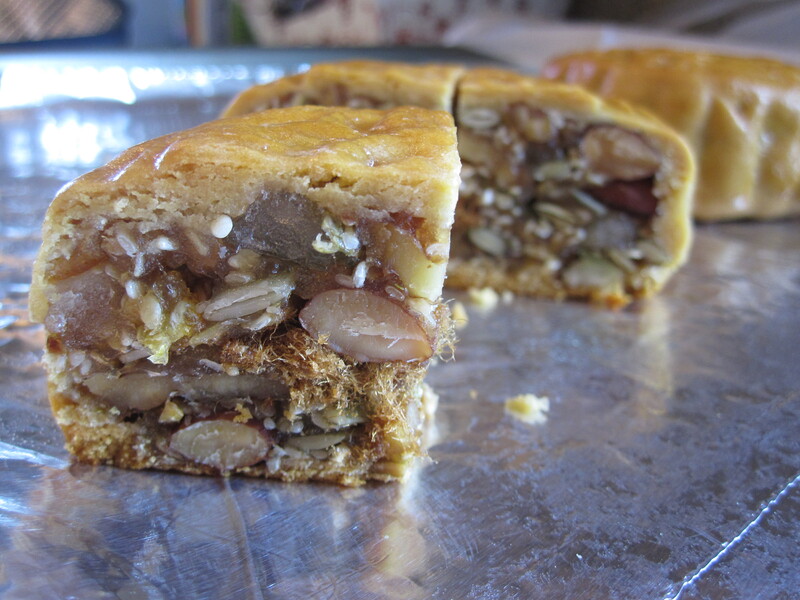 This is my second year making mixed nut moon cakes. I fine tuned the recipe and improved my wrapping skill after watching some youtube videos. Last year my moon cakes pastry was too thick, but this year the pastry is thinner and more even all around. Flavor comes out great too this time! Mixed Nut Moon Cakes 伍仁月饼 #2– without broiling, the moon cakes look a little pale. 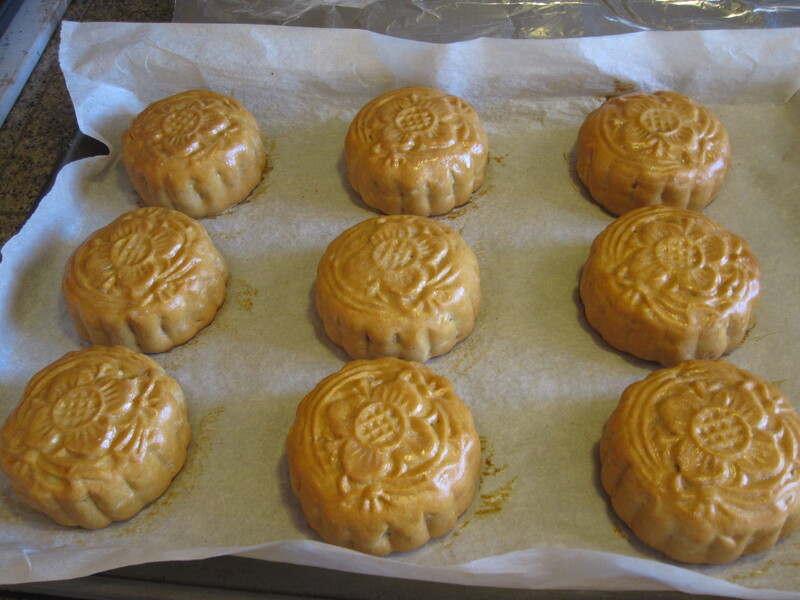 Mixed Nut Moon Cakes 伍仁月饼 #2– this batch were broiled during baking, so the moon cakes are looking very nice! To make the pastry: combine all pastry ingredients in a bowl and mix well to form a dough (the texture will be like play dough). Cover and rest for 1 hours. Then divide into 9 equal portions. While the pastry dough is resting, prepare the filling: combine the seasoning and filling ingredients and mix well (you can use a stand mixer or hand mix). Divide the filling into 9 portions. Use both hands, loosely form each portion into a ball. Scoop in one tsp of pork floss in the center of the filling, then tightly pack and roll to a ball again. Take a piece of pastry dough, flatten with your palm. Carefully wrap a piece of pastry dough around one ball of the fillings. You might want to roll out the pastry dough to a thin layer before wrapping. Also, it’s easier to wrap the filling while you turning it around at the same time. Dust wooden moon cake mold generously with some flour, then knock out excess flour. Carefully put in moon cake and press against the mold. Tap the wooden mold several times (left side, right side, bottom and top side) on a hard surface to invert the moon cake. Repeat step (3) and (4) for the remaining pastry dough and fillings. Preheat oven to 350°F. Before popping the moon cakes into the oven, spray some water on the moon cakes (this is to remove the flour dusted on the surface so when moon cakes are baked they won’t have a powdery look, and also to prevent cracks on the top). Bake for 25 minutes, remove and apply egg wash, then bake for another 5 minutes until the moon cakes are browned nicely. Then turn on top broiler, and broil for 1 minute. Turn off broiler and let moon cakes sit in the oven for 1 more minute. Remove and cool on the rack completely. Store in air-tight container for 3-4 days before serving. 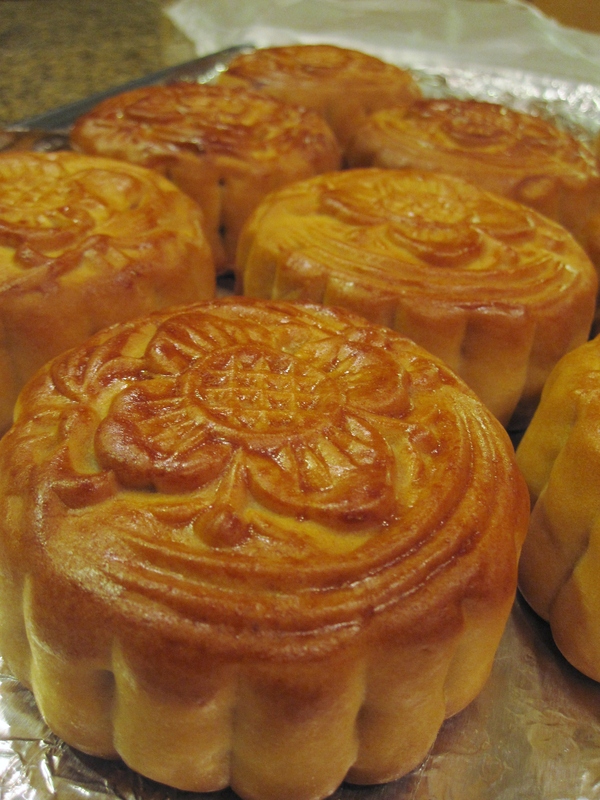 Unlike typical baked goods that calls for freshness, moon cakes are best served several days after baking. This is because when moon cakes “age”, the oil from the fillings and pastry slowly penetrate to the surface, soften the pastry and enhance the flavor even more. Before molding the first mooncake, dust the mold with flour generously to prevent mooncake from sticking to the mold. If the mooncake stuck, keep tapping the mold and gently remove as much as possible. Scrap off as much pastry dough as possible and patch it back to the mooncake and reshape to a ball again. If the mold has residual pastry dough then it will affect the marks and the look of the mooncake. To remove pastry dough residual, add in some flour and scrape off with the use of the tip of a knife.